Although the popular muscial quickly sold out, $10 tickets to hit musical are still possible through a lottery. 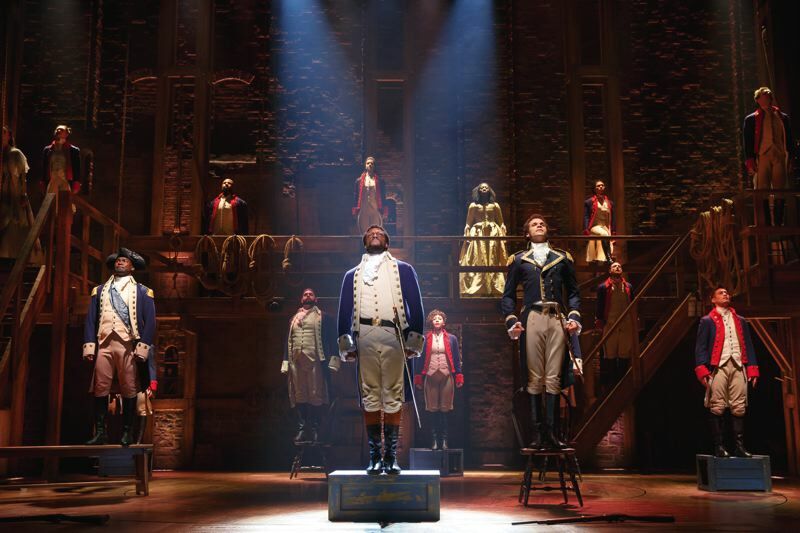 The megahit musical "Hamilton" opens in Portland later this month. The multiple Tony-awarding winning show, based on the life of Founding Father Alexander Hamilton, debuted on Broadway in 2015, thrilling audiences ever since. Creator Lin-Manuel Miranda based his audacious, multi-ethnic musical on Ron Chernow's bestselling biography "Alexander Hamilton." Miranda reportedly read the book on vacation. Struck by how the power struggle between Alexander Hamilton and political rival Aaron Burr was like the rap battles that flew back and forth between Tupac Shakur and Biggie Smalls, Miranda knew he had the idea for his next musical. The score for "Hamilton" includes catchy, unforgettable musical numbers blend hip-hop, jazz, R&B, rap and classic Broadway musical styles. The show, bursting with energy, inspires audiences to the point of singing along, most often during the song "You'll Be Back," King George III's darkly gleeful warning to the upstart colonies. 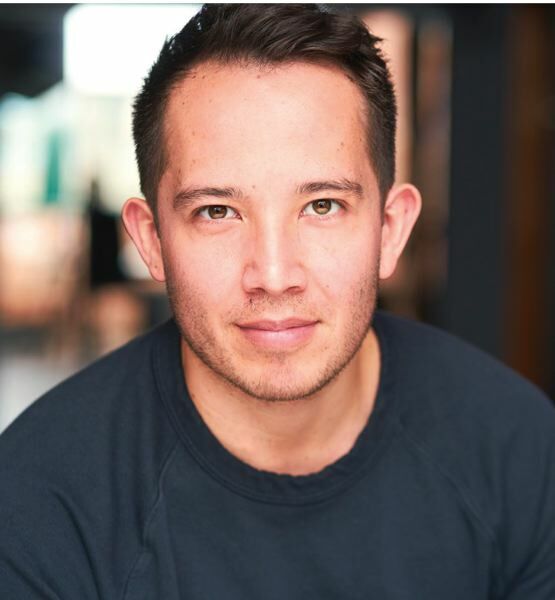 The actor Joseph Morales plays Hamilton. He starred in Miranda's "In the Heights," 2008's Tony Award-winner for Best Musical and was the alternate Hamilton during last summer's Chicago production. The Tribune reached Morales halfway through a six-week run at Seattle's Paramount Theatre. We asked why people are so astonished by a show about the American Revolution and its aftermath. "Lin wrote a story about humanity at a time the world needs to be reminded that we are all searching for the same things," he said. "At our best, the audience leaves the theater seeing themselves onstage and thinking about their own lives, the choices they make and, hopefully, believing that the world is wide enough for all of us. The DNA of our show is love, and about being of service to others. That's the reason it is such a phenomenon." Morales attended Southern Oregon University in Ashland, but dropped out to start his New York career. Returning to that "magical town" to be a performer at the Oregon Shakespeare Festival is on the top of his bucket list, he said. "I only went to SOU for a year, but it was a very significant time," he said. "I saw some of the best theater I've ever seen there. I owe so much of who I am today to that one year. I met the most incredible humans who are still very much a part of my life." His former SOU theater professor Craig Hudson, the owner of Ashland's Cabaret Theatre, has been a mentor and friend every step of the way, Morales says. "I thank the universe regularly for Ashland and SOU." Coming down from playing Hamilton — a powerful journey through love and war — isn't simple. "I live a full life every night," Morales says. "It can be pretty intense. The physical act of a shower helps my brain reset and wash all those feelings away. Hanging with my dog relaxes me, too. He has no idea what I just did and doesn't care. I love that." When tickets for the show went on sale in November, Portlanders lined up in the rain for hours to drop hundreds of dollars at the Portland5 box office downtown. Meanwhile, the online ticket sales site flooded as people like Cynthia Ganley-Williams hovered over keyboards to buy tickets. Buying tickets was a frenzy, Ganley-Williams says. "We were in the queue, and then we were out of the queue. I hit the wrong key and it came up as $1,200 for four tickets, and I was like, 'Back out! Back out!'" Eventually she landed four balcony tickets. "I felt victorious." A strict limit of four tickets per person was enforced. But Portland5.com didn't use a bot filter and tickets reportedly ended up on Craigslist for three times the price that same day. The best chance of getting a ticket now is to enter the "Hamilton" lottery, the details of which will be announced closer to the performance dates. In each city, 40 $10 seats are set aside for each show in an effort to disrupt the ticket industry, salute the $10 Founding Father, and improve access. "No way I could have afforded a ticket," says Nicole Lane of Portland's Artists Repertory Theatre in Portland. "That you have to actually win a lottery to get in sort of says it all." David Walker, a Portland writer, also was priced out. "I love the Hamilton soundtrack. I listen to it all the time and pretty much cry every time as well." Marni Beardsley bypassed Portland and took her family to Seattle, where it was marginally easier to buy a seat. Her daughter, 12 year-old Frankie Diller-Beardsley, called the show "the new Shakespeare. It's prose and rap, singing and dancing. Some people say 'Hamilton' is dead or it's a trend, but it's not: There was not one empty seat in that theater!" Traveling cast members will be under tight wraps in Portland, says Julie Furlong, who does media relations for "Hamilton." Even she doesn't know where the cast stays while they're on tour. Where: Broadway in Portland series, Keller Auditorium, 222 S.W. Clay St.
More: The musical has won 11 Tony Awards, a Pulitzer Prize, a Grammy Award for Best Musical Theatre Album, and Drama League Awards for Distinguished Performance and Outstanding Production of a Musical. There's still a chance to win the Portland lottery. Download the "Hamilton" app on your phone to keep an eye on when the lottery opens. Daniel Pollack-Pelzner, a Shakespeare scholar at Linfield College, has written about "Hamilton" since it opened in 2015. His last article for January's New Yorker magazine is called "The Surprising Timeliness of Hamilton." Tribune: Will you attend the Portland production? How many times have you seen Hamilton? What song do you love to belt out when no one is around? Pollack-Pelzner: I couldn't get tickets to the Portland run. But I was lucky enough to see the original cast in previews on Broadway, down the row from Vice President Biden, in 2015, and then to cover opening night in London this December and chat with Miranda there. My jams: "My Shot" to rev me up; "The Room Where It Happens" on my morning commute; "Helpless" on the way home; and, when no one's around, Jefferson's rapid-fire rap from "Washington On Your Side: "If Washington isn't gon' listen to disciplined dissidents, this is the difference, this kid is out!" Tribune: Why does "Hamilton" remain relevant and continue to reverberate? Pollack-Pelzner: Its wordplay and rhythms are so brilliantly multilayered; its casting is so fresh; the dramatic stakes are so high. It makes the conflicts and characters at America's founding feel like they're clashing right down the block. 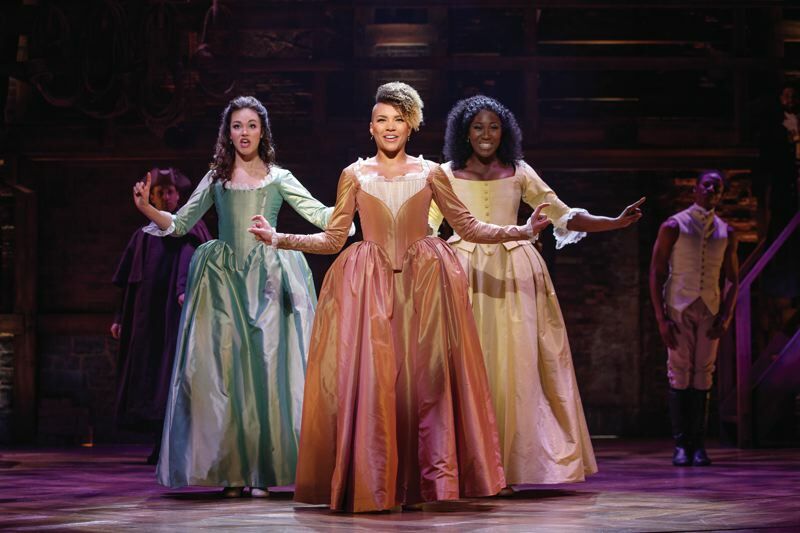 Tribune: Sometimes by the time a big production like "Hamilton" hits Portland, the population cynically feels like "it's over" or they missed the zeitgeist moment, and they don't get excited. What do you say to people who think they already know what they need to know about the show? Pollack-Pelzner: I say: Give me your tickets, please! As Hamilton sings, "This is not a moment; it's a movement." When the musical opened, it captured the promise of Obama's America: racially inclusive, philosophically glittering, pro-feminist, hip-hop savvy. In Trump's America, it feels newly defiant in its celebration of hyperliterate immigrants as the fearless architects of American independence. Tribune: Like many fans, my family had all the songs memorized before we saw it in Chicago last summer. Do you recommend familiarizing yourself with the music? Pollack-Pelzner: Yes —listen to the cast album on repeat. Your whole family will thank you. My 5-year-old daughter will come up to anyone and ask: "Pardon me, are you Aaron Burr, sir?" My 8-year-old son parades around the house in King George's crown and robe, preening: "You say the price of my love's not the price that you're willing to pay." He just wrote a Hamilpotter mashup about a Quidditch match gone wrong: "No one else was on the broom when it happened." You know the story already (revolution, constitution, affair, duel), so the more you know the songs, the more you can savor Hamilton as Socrates, throwing verbal rocks at these mediocrities — as well as the brilliance of director Thomas Kail's nonstop staging. Tribune: On what level do you place Manuel-Miranda's musical abilities and his writing? Will you be teaching a course on Hamilton one day? Pollack-Pelzner: He is our Shakespeare. No doubt. I'm teaching a course on the musical this semester, in fact: "History Plays from Henry V to Hamilton." Tribune: Who is your favorite character and what is your favorite moment in the productions you have seen? Pollack-Pelzner: Oh, my favorite is Angelica Schuyler, of course — the oldest and the wittiest. But the best moment for a Shakespeare scholar? When Hamilton, son of a whore and a Scotsman, quotes "Macbeth" to Angelica: "I trust you'll understand the reference to another Scottish tragedy without my having to name the play."